Iain Laurie is an Edinburgh-based cartoonist and illustrator who has carved out a niche with his dark, horror-inflected artwork. He’s best known for his work on graphic novel And Then Emily Was Gone, described as ‘equal parts Twin Peaks, True Detective and The Wicker Man‘. I asked Iain about his work routine, support from other cartoonists, and what keeps him motivated. Tell me a bit about your creative work. I draw weird comics. 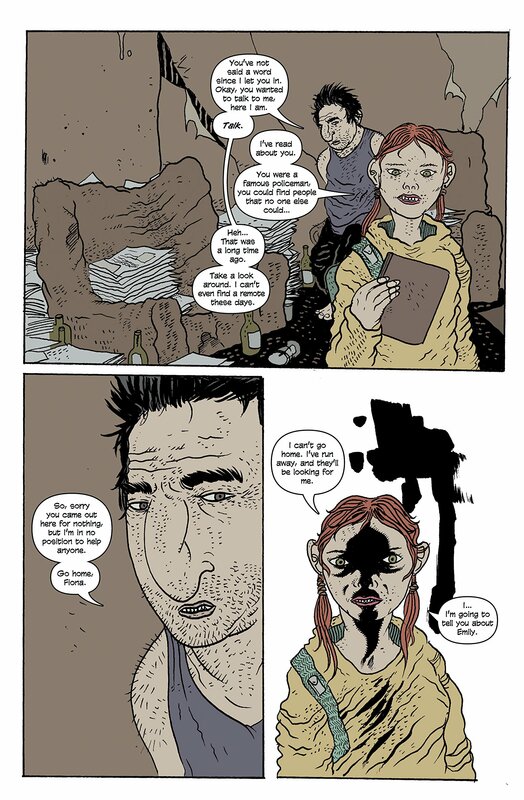 I’ve done a lot of small press stuff but if anyone knows my work it’s usually through a graphic novel called And Then Emily Was Gone written by John Lees. How did you get to this stage of your creative career – have you always wanted to be an illustrator and a graphic artist? Pretty much. At school when we were asked what we wanted to do as a job I always wrote ‘cartoonist’. For a long while I got really interested in film and drifted more towards that, but I was always drawing. I went back to college as a mature student and did an Illustration and Design course, but didn’t find it that useful. On the course was my friend Garry who was constantly told his work wasn’t up to standard. After the course he went to the US where he now works for Marvel and DC Comics. I think that covers the level of the course. It was useful in a way that it got me drawing, but I didn’t take anything from it I couldn’t have learned myself from books or online. I started work on a comic strip with my friend Fraser Campbell called ‘Black Cape’ which was published in Wasted magazine. We had a really bad experience on that so I decided to start doing more experimental left-field stuff under the banner ‘Powwkipsie’. Through that, I self published a small-press book called Iain Laurie’s Horror Mountain. Although only about 20 people read it, it was well received, and one of its reviewers was a Glasgow writer called John Lees. John got in touch and we bonded over a love of David Lynch. From there we set up Emily. Can you describe your routine for creative work? e.g. when/where you work, any strategies you have for getting started, staying focused, overcoming procrastination, self-doubt etc. I work from home, in my living room surrounded by mess and pens. In terms of getting started that can be tough. I’m naturally lazy and work full-time at a day job, so when it comes to free time it’s tough to get motivated. Deadlines keep you going, and also if you’re working on something where you’re invested. Overcoming self-doubt is tough as I get that a lot. I think you just have to work through it and believe in yourself. I don’t know if there’s an easy answer for that. What are some of the things – people, opportunities, inspirations etc. that have been essential to you? What kind of support have you had along the way? Essential to everything I do is the filmmaker David Lynch. He’s my number one inspiration and whenever I hit a creative trough I read Lynch On Lynch or I watch his films. I also look at Scottish artists like Peter Howson, Charles Avery, John Byrne or Frank Quitely. I’ve been really lucky though. I’ve had a lot of support from established people who like my stuff – especially from the US. For instance on Emily a number of top cartoonists like Nick Pitarra, Riley Rossmo and Garry Brown among others offered to do covers for the comic, only because they liked it and liked what me and John were doing. That was essential in getting people interested in the comic. There’s also my partner who is incredibly understanding about me spending so much time at the board. That’s really essential. I constantly think about giving up. There’s not a lot of financial reward and it’s proper hard work and it takes it out of you, both physically and mentally. But I love drawing, pure and simple. Were there any particularly difficult times? Was there ever a time when you thought about giving up? I constantly think about giving up. There’s not a lot of financial reward and it’s proper hard work and it takes it out of you, both physically and mentally. But I love drawing, pure and simple. Sometimes in the middle of a tough page or a deadline or whatever you lose sight of that. After I finished Emily I didn’t want to draw for a while as it felt like work, but a few days later I was working on something else. What were your turning points, or what achievements are you most proud of? The answer to both questions is And Then Emily Was Gone. Its success, reviews and just our reception at things like the New York Comic-Con was pretty insane. Do you earn a living from your creative work, directly or indirectly? If not, how do you get by? How do you balance earning money with focusing on creative work? I don’t earn a living from drawing. That seems rarer and rarer these days, and how I draw is quite niche so there’s not loads of opportunity to make money. I work full-time in a standard day job scenario so as I’ve said it can be really tough finding time and energy. That’s when you find out if you really want to do it or not. What does security look like to you? Is it important to you? Security to me is not having to worry about money every minute of the day, and it’s hugely important. I came from quite a working class/lower middle class background, so I have that burned into me. What would creative success mean to you? Just getting to do what you want, follow creative paths that you want. I would tell him that just because you can’t draw as well as artists in the comics you like, you can still make comics. If you’re an upcoming comic artist and you’re not on Twitter then you’re making a mistake. What has the internet / social media meant for you? Everything. It helped me meet people who would end up supporting me, gave me a way to befriend other artists, promote my comic, get commissions. If you’re an upcoming comic artist and you’re not on Twitter then you’re making a mistake. Tell me what you’re working on now / what’s coming up next. Right now I’m working on a pitch with John that’s our follow-up to Emily. It’s in the same vein but quite different. I’m also working with another US writer, Steve Orlando, and there’s a few things bubbling under. Hopefully some of my own stuff, and possibly some writing too. And Then Emily Was Gone is available online or at your local comic shop. Find Iain on Twitter: @IainLaurie.